Love A Child medical facilities in Fond Parisien, Haiti. One of our most widely used ministry outreaches is our regional medical clinic, the Jesus Healing Center. 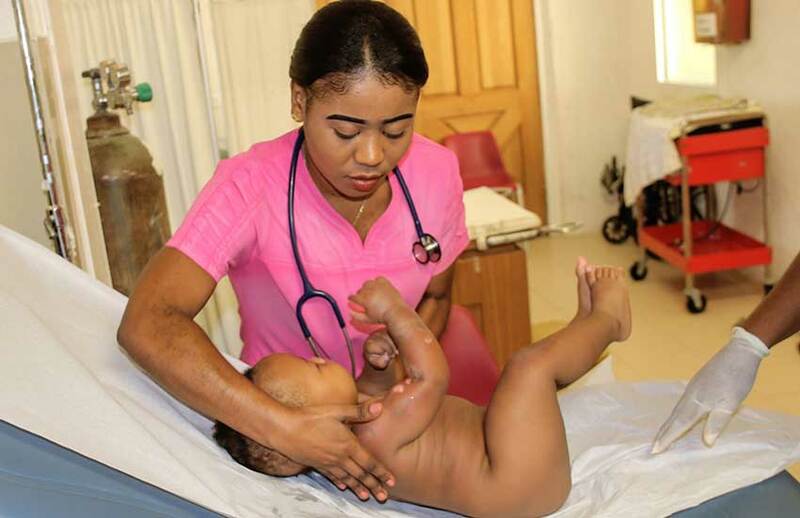 It is the only facility that offers any medical care for thousands of poor Haitians in the Fond Parisien area, who otherwise would have no access to medical care at all. It is a great blessing for so many people five days a week. On a daily basis, our incredible staff at the Jesus Healing Center handles a wide range of cases. 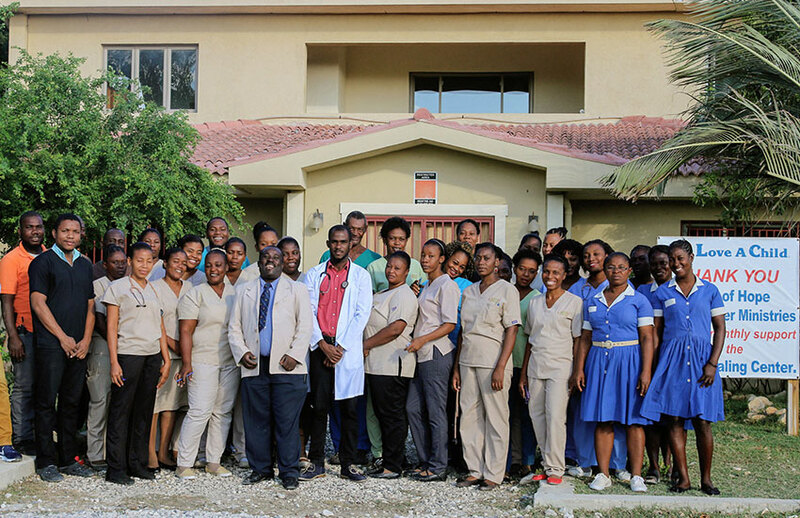 People come from all over Haiti to our medical center. We treat on average two hundred people a day. We see patients with burns, wounds and so much more. 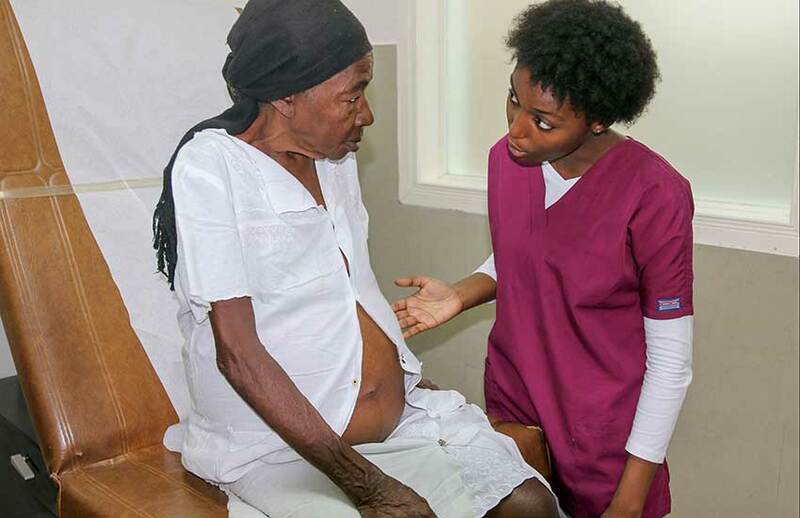 The doctors and nurses see a lot of vehicle accident victims, and many pregnant mothers too! Our Jesus Healing Center has been such a huge blessing to the community here in Fond Parisien, Haiti. Look at how our staff has grown! 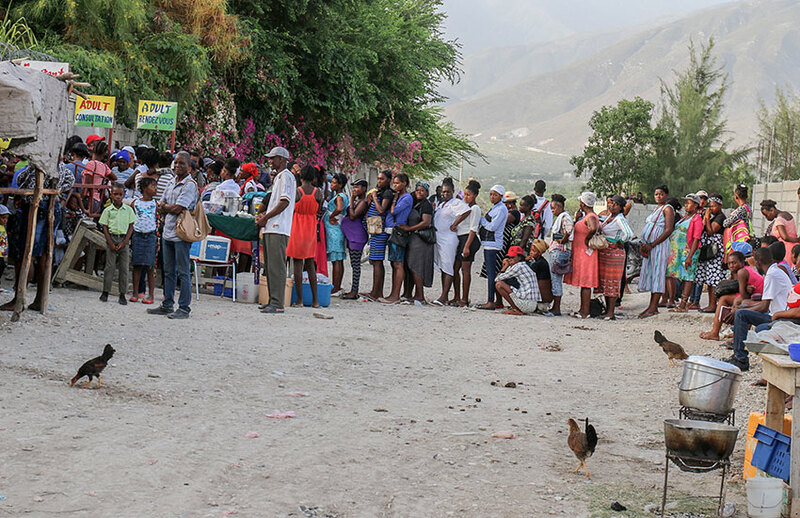 Early each morning, when we are up with the chickens, a waiting line forms outside the gate as hundreds of people gather to get first in line to enter the clinic. We have so many patients coming to our Jesus Healing Center each day, that we are busting at the seams. This is Junior Michel, who has a severe open wound. Our “future doctor,” Roselyne from our Love A Child Children’s Home, is taking good care of him. Roselyne is in her last year of high school, but she spends every chance she has at our clinic learning. She wants to be a doctor, and she will make a great one! 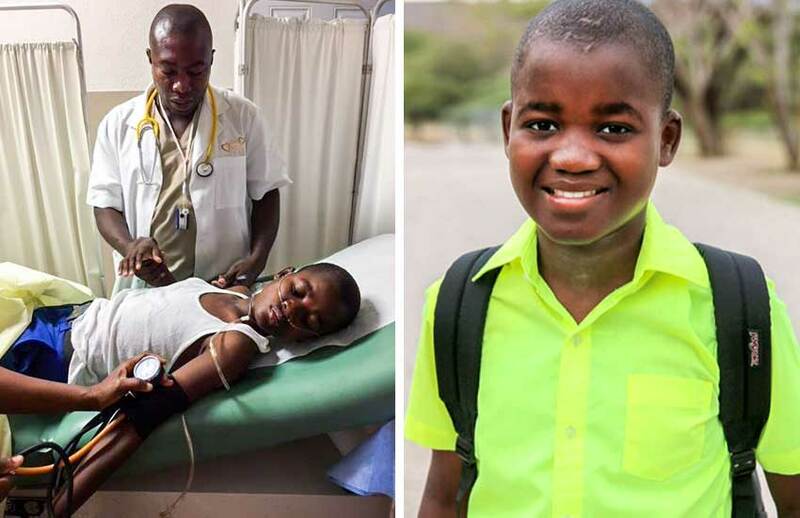 Many of you have followed our story about the Haitian boy Djonsly Alcin. 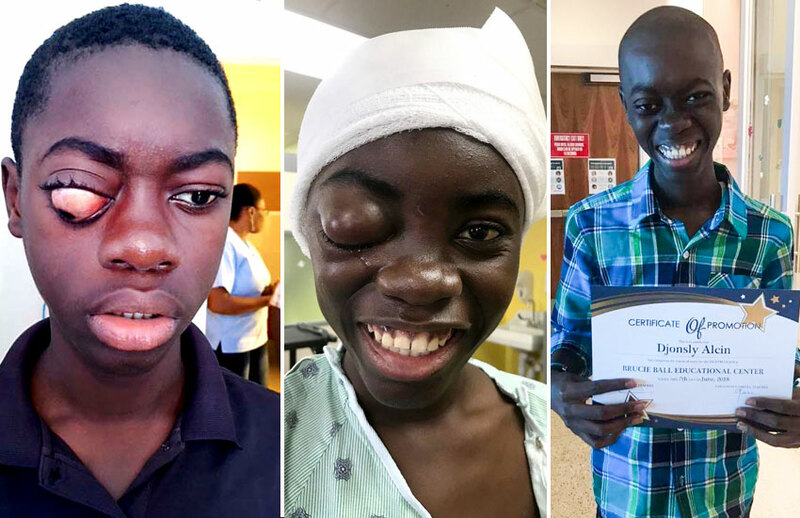 He is the 14-year-old boy who was brought to our Jesus Healing Center months ago with his eye “bulging out of his head.” His mother had taken him to several clinics and hospitals but found no help. We sent him in for scans and found out that he had a “tumor,” which started in his brain and moved to the optic nerve, pushing his eye out of the socket. The amazing thing about this boy is that Djonsly, even in this condition, is a sweet child, and has made the highest grades in his class at school! We found a hospital and some excellent doctors in the States to take care of him, and he had surgery, but they could not remove the entire tumor, as it would have cost him the sight of his other eye. We found out that he will be in the States for chemotherapy for a year. His cancer has spread to his spine. While there, he is enrolled in a school program. Thank you to all who donated funds so Djonsly and his mother, were able to fly to Miami and receive the critical treatment he so desperately needed. Please continue to pray for Djonsly Alcin. 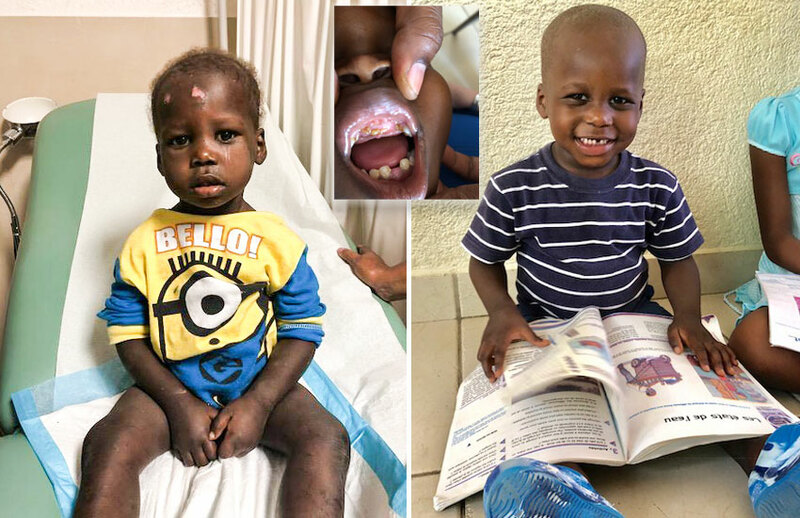 We had a big scare earlier in the year when one of the Haitian children in our children’s home became very ill. Mackenson got so sick in school that we had to bring him to our Jesus Healing Center. He could not walk, communicate, or breathe! His eyes rolled around, and he nearly collapsed! Our Haitian doctor said he is like someone who has had a stroke! 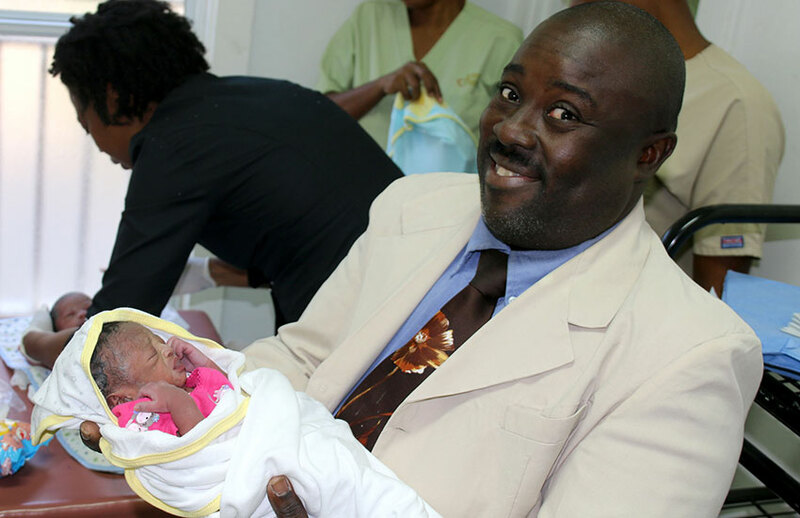 We had to send him from our Jesus Healing Center to the L’Hôpital Bernard Mevs in Port-au-Prince. When he came home from the hospital, he continued with his physical therapy, and he continues to improve. This little boy was found “dumped in the mud” at our front gate and was brought back to the Jesus Healing Center. There were burn marks on his body, his hair was red, and he had stripes on his back and belly where someone beat him. His teeth were either rotten, or someone hit him and knocked them out… not all of them, but some in the front. He didn’t talk, and he was very “quiet.” Our doctors at the clinic feel sure he was abused very badly. We brought him back to our orphanage, bathed him, fed him, held him and gave him clean clothes and a toy, and he fell asleep. Bien Social Services (Social Services of Haiti) was not open that day, but we took him as soon as they opened and gave them all the information that we had on the boy. He did not talk so we didn’t know his name. He ended up staying in the hospital for a couple of weeks, as they needed to do more tests. They had to put a feeding tube in him for a while. They also discovered he had a cracked (broken) collarbone! What abuse! As soon as Social Services released him to our Love A Child Children’s Home, we named him Noah Burnette. He was afraid of everything, and he had several health issues that put him back in the hospital. He is slowly on the road to recovery. He eats food now, though often he tries to hide it. He is very cautious of people, and he is starved for love. He is really starting to come out of his shell. He wants to do chores at the children’s home, and he tries his best. He is such a joy, with a big smile and laughs and gets into mischief. He is now walking and getting lots of hugs from his new family. He’s come a long way in such a short time. Noah started pre-school in September. It is a huge job caring for abandoned babies, and our own sick children. Please hold them in your prayers. When it comes to heavy machinery here in Haiti, there is always something that breaks almost every day. This summer, our old generator that runs the Jesus Healing Center blew up. We had already rebuilt the engine twice, and it finally wore out. 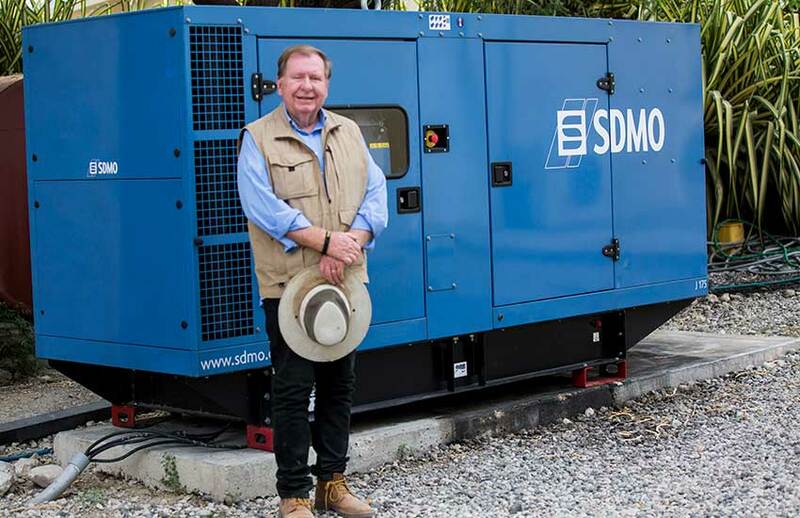 We had to buy a new 200,000 KW generator fast on credit, and then pay $38,500 two weeks later. It’s tough to live where you don’t have electricity, and you have to use generators. This was an emergency! For the poor people of Haiti who have nothing, and are desperate for good medical care, this generator is an urgent need. Praise the Lord! We reached the whole need of $38,500 for the new generator! Bobby and I, along with all the Haitian people want to thank all of you who prayed for this need and those who gave. We all prayed and trusted in the Lord together, and He did it! Thank you again. Love Is Something You Do! We see all kinds of cases at our Jesus Healing Center, everything from sores, to severe burns, to shingles and Voodoo. Many times, we get children who have fallen into a charcoal fire or someone who has been in a motorcycle accident, and much more. 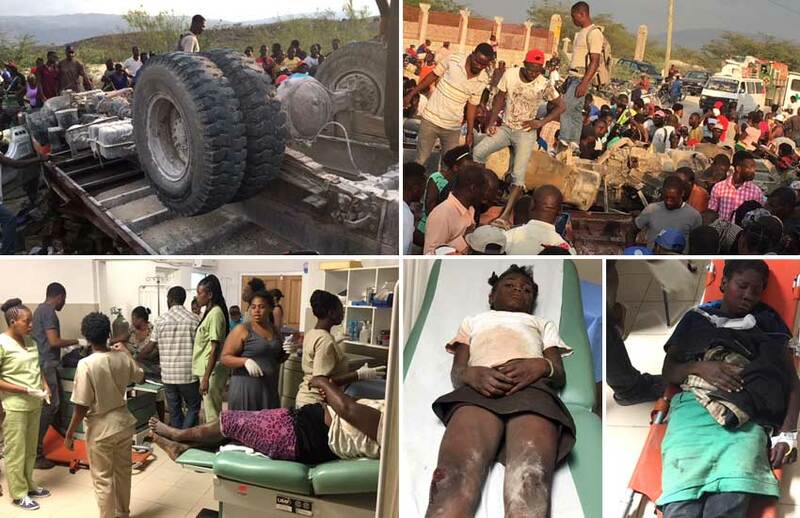 In March, a huge truck had a blowout and flipped upside down, crushing many poor Haitians! Four were dead on the spot. Our Haitian daughter, Julanne, happened to be there and helped with many of the accident victims. Some were brought to our Jesus Healing Center, and others who needed additional care were sent to the Government Clinic in the next town. Since the Government Clinic does not have an ambulance, we must always be on call. Four were dead and others so severely crushed that they didn’t make it. We want to thank David and Nicole of Faith Church for sponsoring our life-saving ambulance! As our Haitian children grow up, they are thinking about their future. Many of our older girls want to go into Nursing after high school. This is Dimelia. She is in her last year of school here, but she loves to volunteer at the Jesus Healing Center. As our Jesus Healing Center continues to grow, on our very busy days, some of our older girls are helping with many of the patients. They are such a blessing! We are so thrilled with Jovanie who grew up in our children’s home! Jovanie just graduated from nursing school in September, and we could not be more proud of her! She has been working in our Mobile Medical Clinics with us as well as our Jesus Healing Center! She has exceeded everyone’s expectations and can “whip anyone into shape.” She acts professionally, and the doctors love working with her because she isn’t afraid to jump into whatever the situation might be! We are extremely proud of her and her accomplishments! The Bible says, “He that winneth souls is wise.” Proverbs 11:30 — This is Pastor Luckner. He works full-time at the Jesus Healing Center. His job is to pray and minister to all the people who come to our clinic. He spends a lot of time in our Emergency Ward because we see so many accident victims. Each day, the poor have problems, and each day, Pastor Luckner encourages them in the Word of God. People are being saved, and also receiving “healing for their heart” as well. 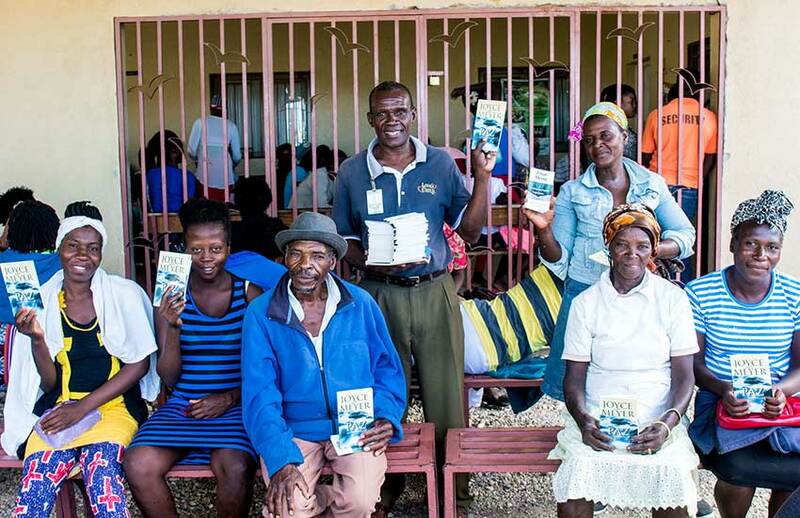 Pastor Luckner distributes Bibles to those who receive Jesus, but everyone gets a Joyce Meyer Booklet in Creole, and the people just love them! Looking back on the reports from 2018 for the Jesus Healing Center, we looked at the numbers of patients, vaccinations, family planning, and pregnant women we have seen! The total number of patients this past year was 55,439, and the total combination for vaccinations, family planning, and pregnant women was 20,782! This was a significant increase in all areas from the year before. We want to thank Joyce Meyer Ministries – Hand of Hope for sponsoring the monthly operating cost of our Jesus Healing Center and our Malnutrition Clinic!!! Look at all the lives that were touched, healed and blessed!!! God is alive and well, in the Jesus Healing Center! Thank you, partners, for helping change lives in Haiti every day. Please, hear the “cry of the poor,” and “do something” today. And when you do, God will bless you for “considering the poor!” (Psalm 41:1-3) If you would like to speak directly to one of our staff members, please call (239) 210-6107 or email us at info@lachaiti.org. Thank you to our partners and sponsors who made all this happen in Haiti in 2018. Look for my next journal of the 2018 Year in Review series to see all the things we have done with your help. God did so many great things that we want to share with all of you.